We were having one of those mild January days which, whilst not exactly tropical, was conducive to perhaps eating al fresco. I had read about the stunning views over Leeds City Centre from the roof garden of East Parade Social so I decided to check it out. It was closed! I am not having the best of luck with establishments on this thoroughfare as the last time I came to East Parade to do a review, the restaurant I had set my heart on was undergoing refurbishment, so not open to the public. I decided to cut my losses and settle for a table inside. The very pleasant chap behind the bar confirmed that the view from the roof is tremendous, but it won’t be open until the weather improves a bit more, and then probably only in the evenings at the back end of the week. I suppose that this makes sense as they will need to employ extra staff so need to be sure of customers being able to use it on a regular basis. Let’s hope that we have a summer like last year. The interior design of the place is a clash of styles but which just seems to work. 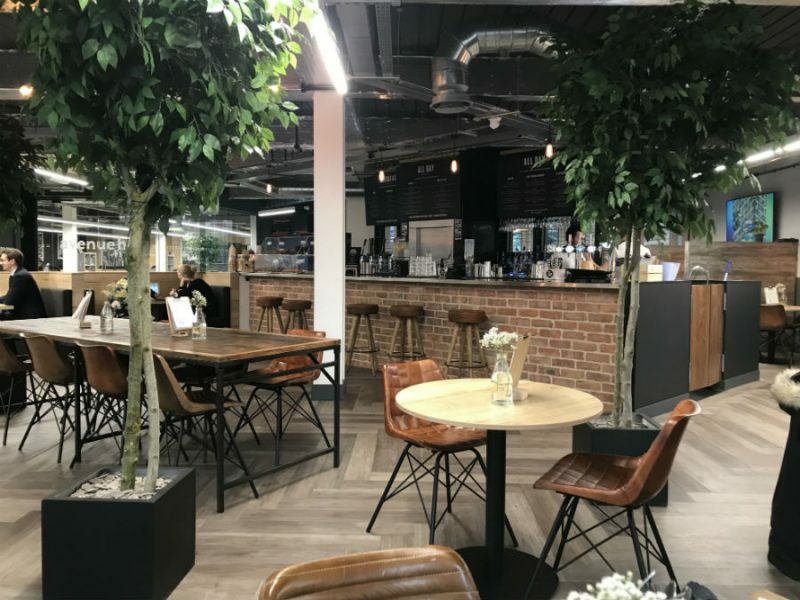 The ceiling is industrial chic, with exposed air conditioning extractor outlets and other stainless steel and aluminium fittings, whereas on ground level there are potted trees with furniture made from wood, leather and black steel with a brick bar. 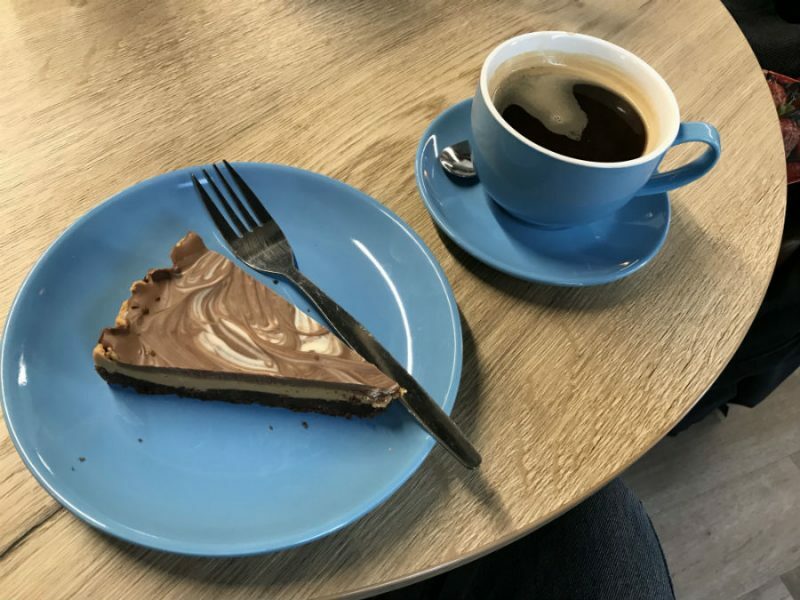 It shares the ground floor with the reception of avenue hq, an office complex which makes it feel a bit like the staff canteen, especially as my fellow diners were either hard at work on their laptops or holding impromptu meetings. The young, enthusiastic participants in these activities made me appreciate my being somewhat more elderly than they and being able to work to my own timetable. Even we loafers need to eat, so I sat at a table to peruse the menu. There is a dedicated Breakfast section which is available until noon and an All Day part which contradicts itself by only being available from midday. The latter part displays a selection of sharing plates, nachos and flatbreads from which I chose my lunch of Pulled Pork with Tomato Base, Mature Cheddar, Jalapenos and Rocket, which came in at £7.50, or 7.5 as bars seem intent on displaying their prices nowadays. Customers order at the bar, where I espied a pump dispensing Kirkstall Brewery Virtuous IPA, so indulged in a pint of that for a fiver. 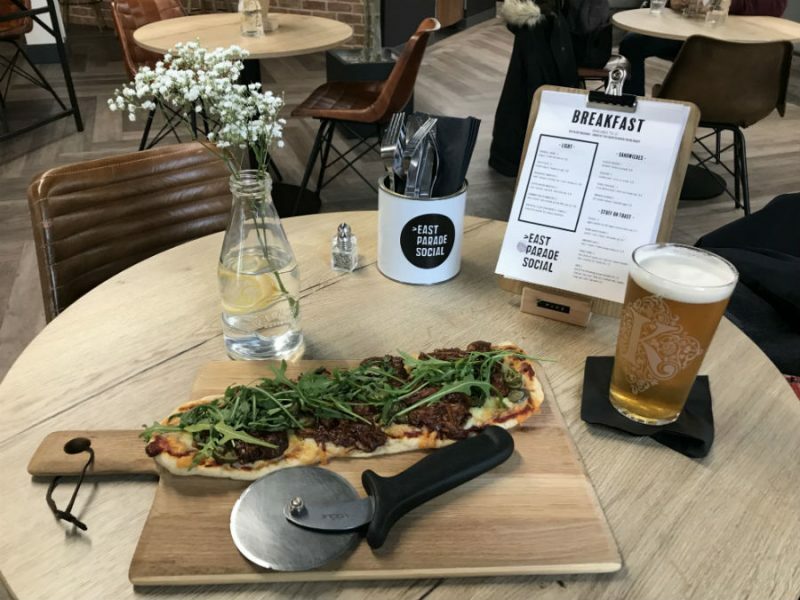 The term ‘flatbread’ covers a multitude of products, but this one was a large oblong pizza base style bake which was very well cooked and presented covered in tomato sauce, the promised pulled pork and cheese, then sprinkled with slices of the chillies and rocket. In addition to the cast members on the programme, there were some fried onions which were beautifully sweet and gave the dish a further dimension, but a less welcome interloper was barbecue sauce in which the pork was covered. I always find this a little on the sugary side and this was no exception, being too sweet for my liking, but it is all a matter of taste. Had the barbecue sauce been advertised on the menu I would have probably chosen a different topping such as chorizo. 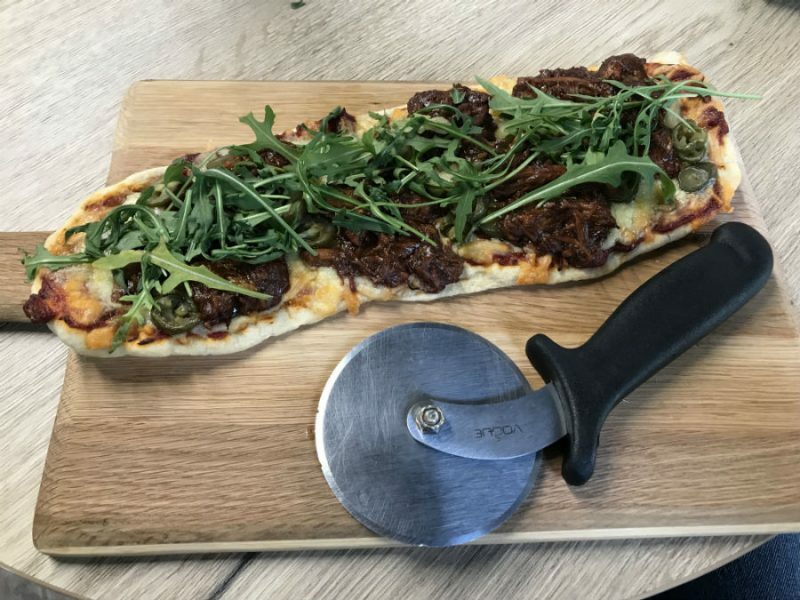 The sauce did not prevent my finishing the flatbread, a job made easier by the inclusion of a pizza cutter which sailed through the base, saving me from the vigorous sawing with a table knife that this type of flatbread usually entails. The choice of dessert was somewhat limited, with what looked like the remnants of the breakfast blueberry muffins and croissants on display, but there was a very appetising home made ‘cake’ from which I had a slice. I asked if it was made in-house and was assured that it was, so that was good. It was a chocolate, coffee and peanut butter concoction described on my receipt as a Brownie, which I suppose it was but in cake form. It was an extremely reasonable £1.80 and the Long Black coffee at £2.40 was superb. The brownie was beautifully balanced between moist and chewy, a great finish to the meal. I highly recommend East Parade Social for the food and service. It is also a great place if you just fancy a coffee and a piece of cake. I am now looking forward more than ever to the spring so that I can check out that view. If mentioning that doesn’t ruin the summer weather for everybody, I don’t know what will.